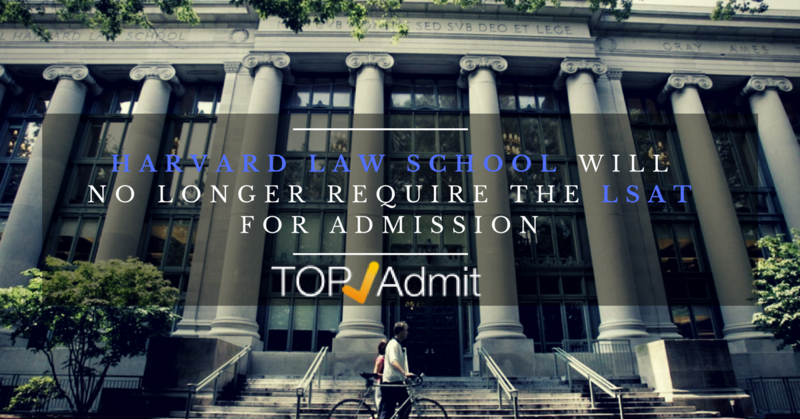 As you finish your Bachelor’s degree or MBA, it’s time to return home with the glory to find the dream job! But wait, your tuition and living cost already cost you a fortune, so how to fund yourself while going around Asian countries for interviews? The general truth is that a better degree gives you a better salary, but not until you have a job. Before that the status of a broke college graduate still exists. And traveling between countries that require plane travel is where Travel Hack will take us today. One of the frustrating things about full-service airlines is that when you want to just travel one-way, it is incredibly expensive to do so. Luckily, with the advent of budget or LCCs (Low-Cost Carriers), they have given travelers more options. However, there are still routes that have not been completely disrupted. 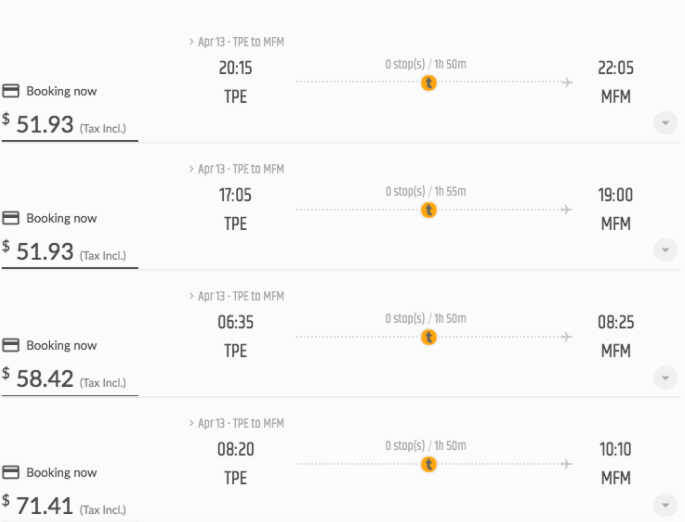 For example, Taipei to Hong Kong is one of the busiest routes in the world and the price of a round-trip ticket between Taiwan and Hong Kong has come down significantly. I still remember the days when a round trip ticket cost US$400-500 on Cathay Pacific. There are now far more options and with direct links between Taiwan and China, round trip tickets on full-service airlines hover around US$180-200. But, if you want to fly just one-way, instead of being half, it is actually more. On EVA air, my preferred carrier, the cost of a round trip ticket was about US$172 vs US$304 for one-way–baffling logic. I checked Hong Kong Airlines, which is a subsidiary of Hainan Airlines. It sells one-way tickets, but it would still set me back US$130, better than EVA but I am still being penalized for flying one-way. I decided to see if I could “hack” this route. 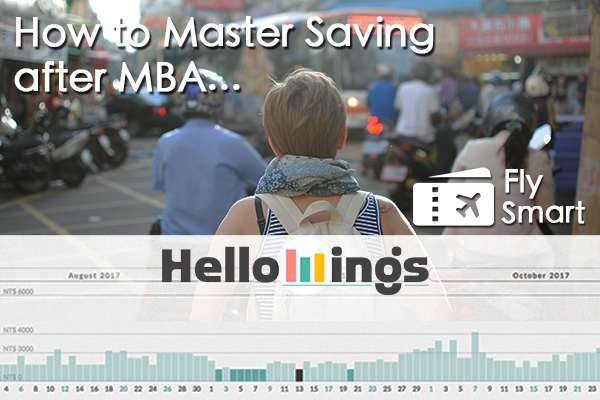 I turned to HelloWings.com, which as far as I know, is the only price comparison search engine for budget airlines. 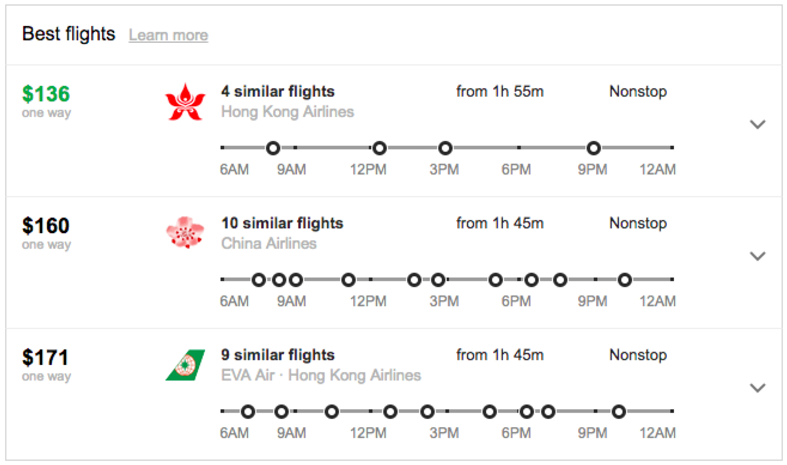 Using HelloWings.com simplifies the research of figuring out which budget or LCC airline flies where, as well as being able to compare prices across a long travel period. Part of the logic behind budget airlines is that they specialize in a few high traffic routes and offer the most competitive prices. 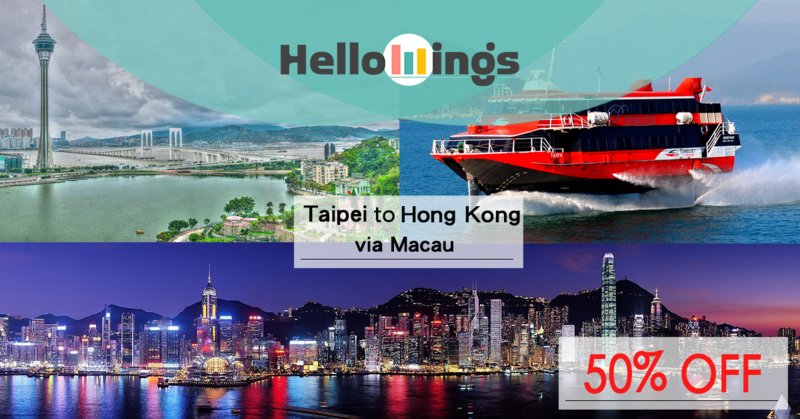 It turns out that there are no budget airlines that fly the Taipei-Hong Kong route, but with a bit of out of the box thinking, I tried Taipei and Macau, which is about an hour away from Hong Kong by jet ferry. 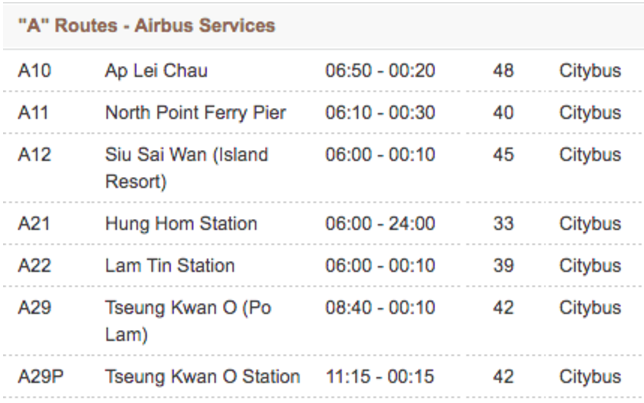 It turns out that Tiger Airways flies a direct Taipei to Macau flight. The price ranges from US$51 to US$300, but the lowest price that I could find was US$51.93. 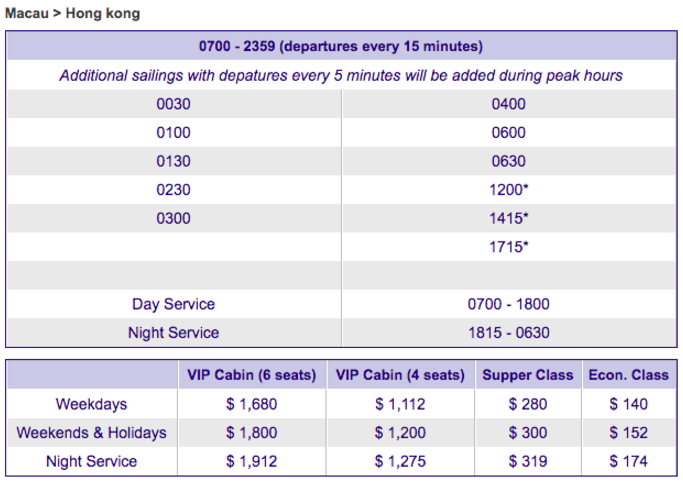 The cost of a jet ferry from Macau to Hong Kong is HKD 140 or around US$18. The total travel time is about 3 hours, but there is an added bonus that you’d get to arrive in Hong Kong Central, which saves the trouble of dragging luggage through the 300m of crowds between Airport Express and MTR. 50% off for your trip to Hong Kong: Travel Hack of the day. Two acquaintances who share many of the same features may be difficult to distinguish from one another. How can you tell them apart? One way is to get to know them better. Even identical twins have unique characteristics in their physical appearance and personality. A lot of people make errors with the nearly identical than/then pair, but you don’t have to be one of them. Just use the same strategy you use to tell one person from another—get to know them! Amanda is shorter than Annabelle is. She would rather die than wear high heels. Annabelle is a friend than whom there is none more caring. Than appears in a lot of idioms. Many of them, such as “more fun than a barrel of monkeys” or “more dead than alive,” feature comparisons. You’ve probably heard some of the most popular ones (e.g., “easier said than done,” “better late than never”) but many may be new to you. For example, have you heard of “more sinned against than sinning”? Wouldn’t it be a fun project to find out how these colorful expressions started? Then often functions as an adverb. 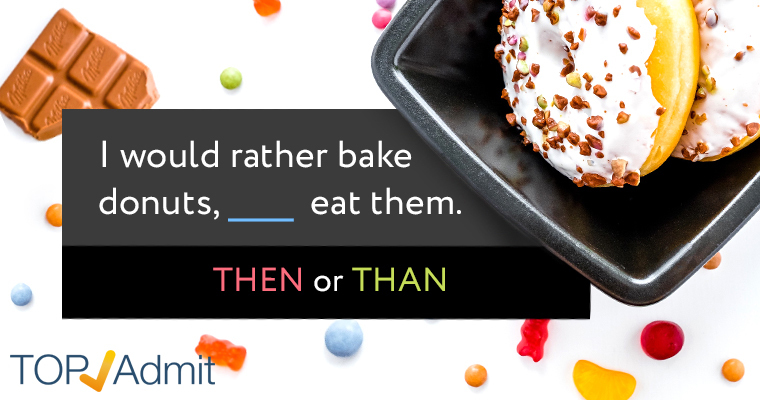 Adverbs modify verbs, adjectives, or other adverbs. Dictionaries define then lots of different ways: in that case, at that time, next in order of place or time, at the same time, soon afterward, in addition, or as a consequence. Standing next to Edwin is Ethan, then my roommate Claire, then me. Edwin told me, “If we are having fun together, then you should take lots of photographs.” There were no digital cameras then! My then roommate Claire moved out and I have not seen her since then. Then appears in some idioms too. One means “on the other hand”: Edwin is funny, but then I laugh at everything. Another idiom means “at that exact time and place, or at once”: Ethan asked me if I wanted to take a road trip, and I went home to pack my suitcase right then and there. Then and than have many similar characteristics. They are spelled alike, except for the E in then and the A in than. However, telling them apart is not impossible. They have different characteristics: How you define than is definitely not the same as how you define then! They have different “personalities” in that they function as different parts of speech. Do you feel that you know them better now?